How do I import outcomes for an account? 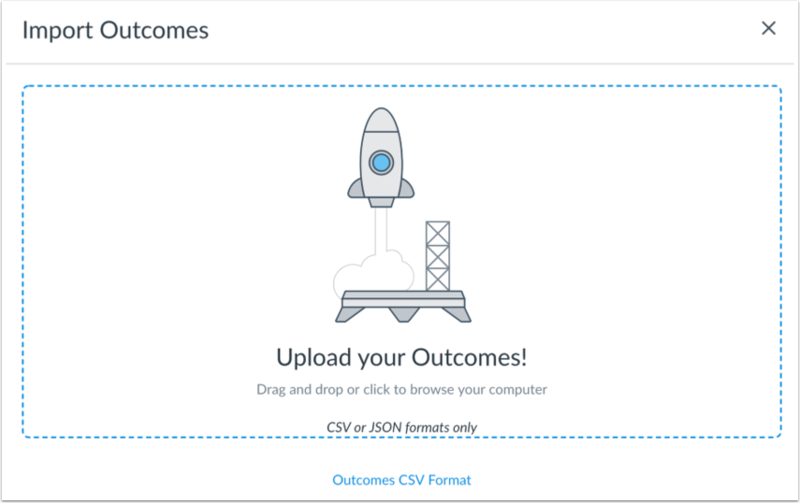 You can bulk import outcomes for your account using a CSV file. A bulk import allows you to add new outcomes to your account or update the details of multiple outcomes at one time. The CSV file must be formatted correctly according to the Outcomes Import Format Documentation. 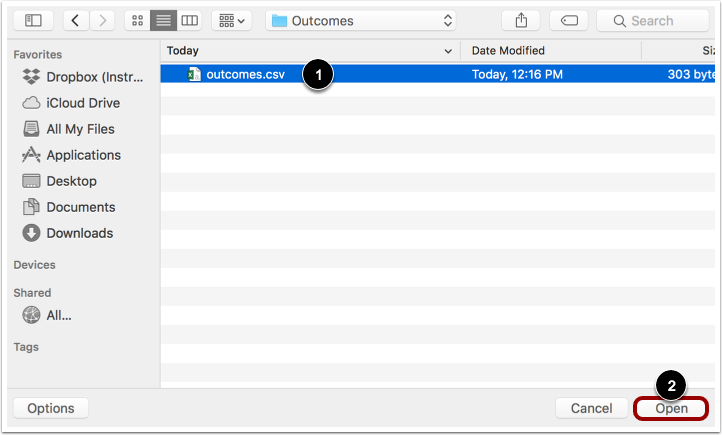 If you don't want to create a new CSV file, you can download the Outcomes Export report from Canvas, change it, and re-upload the same file. After your CSV file has been processed, you will receive an email notification confirming a successful import or displaying errors with your file. If there were errors, the email will contain details about the first 100 errors including the row of the error and a short description. Currently, only CSV files are supported. JSON files will be supported in a future release. Importing outcomes is an account permission. If you do not have permission to import outcomes, your institution has restricted this feature. In new outcomes, the vendor_guid field must not contain a colon. Drag and drop your CSV file to the upload area, or click in the upload area to choose a file from your computer. Locate the CSV file  and then click the Open button . Canvas displays a loading page while the file uploads. Large CSV files may take time to import. 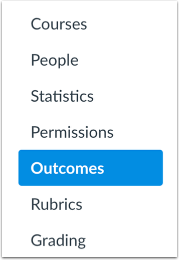 You can leave the Outcomes page at any time without disrupting the import process. When the file has been successfully imported, Canvas displays a confirmation message. You will also receive an email that the import was successful. 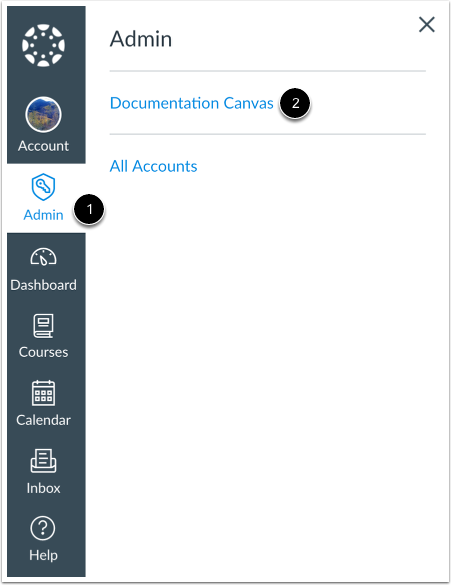 If the import was not successful, or if the import altered existing outcomes, Canvas displays an error message. The error message displays for outcome import errors and for outcome import warnings. You will receive an email with details about the first 100 errors and warnings. Each error or warning will include the CSV row number and a description of the error or warning. Correct the errors in the CSV file according to the Outcomes Import Format Documentation and re-import the file. View the outcomes imported into your account. Previous Topic:How do I create outcome groups for an account? Next Topic:How do I edit or delete an outcome in an account? Table of Contents > Outcomes > How do I import outcomes for an account? 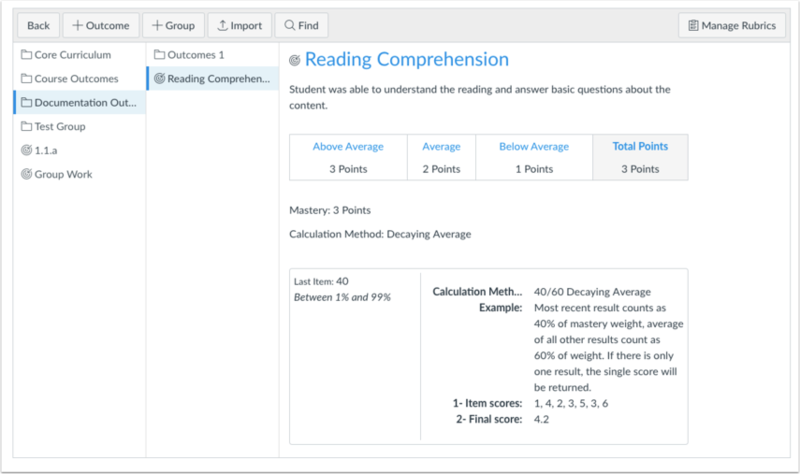 "Canvas Outcomes - Improving and Speeding up Student Feedback"
Re: Account outcomes review and update process?